Minister for Transport Noel Dempsey has said nothing more could have been done during the weather crisis if he had been in the country. Mr Dempsey returned from Malta today and attended his first emergency response meeting. He commended the work that had been done by other agencies to clear the country's roads. The Minister said that he, like everyone else, was entitled to a holiday. He admitted that his being away had been a distraction. The Minister said he felt like he was at home all the time given the amount of contact he had with officials who had briefed him very well during that period. He said he did not agree with the view that people needed to see him here and had decided to come early because his absence was beginning to distract from what he called the ‘good job’ agencies and local authorities were doing in difficult circumstances. Cork Airport will remain closed tonight due to weather conditions. A spokesperson said it was hoped the airport would reopen at 4am in time for first flight departures. Meanwhile, driving conditions remain hazardous in many areas this afternoon and motorists are again being asked to avoid unnecessary journeys. Met Éireann say that this severe weather could last for at least another week, but a 'significant thaw' will occur from Friday onwards. 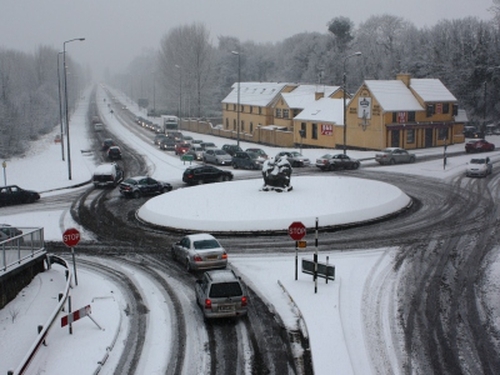 Met Éireann is warning that sleet and snow showers will develop more widely across the country today giving further falls of 5-10cm, with Munster and Leinster are most at risk. Continued heavy snow falls will increase the pressure on dwindling grit supplies across the country. 3,500 tonnes of of salt is due to arrive in Cork tomorrow. Dublin City Council says 200 tonnes were to arrive in the capital today, where Dawson Street was closed for a time last night. Temperatures are forecast to dip to -5C in parts tonight. Hundreds of Civil Defence, defences forces and emergency services personnel have been deployed nationwide to help people struggling to cope with the snow and ice. The Dublin and Letterkenny, Institutes of Technology have postponed exams that were due to take place tomorrow, as has NUI Maynooth. UCD has closed its campuses at Belfield and Blackrock until Tuesday, and while student residences remain open, students are asked to delay their return until Tuesday. Students elsewhere are advised to check with their colleges. Local authorities in the worst affected areas of the country have been distributing water to households where the supply has frozen. The charity ALONE is operating a 24-hour helpline for people in the greater Dublin area, and says there has been great support for those vulnerable and living alone from the community. Four climbers had to be rescued last night after getting into difficulty on the McGillicuddy Reeks near Killarney. Two of the four climbers had slid on hard snow while trying to make their descent. Kerry Mountain Rescue team said the fall, combined with a lack of equipment and a lack of experience led to their being stranded.